Get your Red Carpet street cred updated when you wear fancy looking designer dinner jackets. 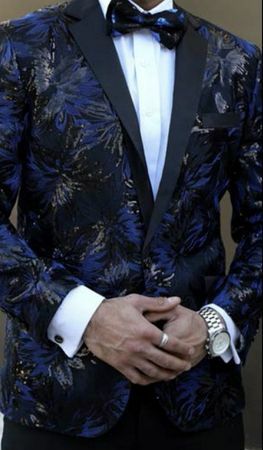 Designer dinner jackets are all the rage on the Red Carpet and in the Clubs and Alberto makes the very best styles out there. This royal blue designer blazer has sequins on it that sparkle in the spot light and lets you shine. Modern fit.